Introducing the GL-358 XL 3-position lift chair by Pride. It's a premier full chaise lounger designed to fit a person over 6' tall. The GL-358 XL has an astounding 500 lbs. weight capacity. Presenting to you the GL-358 XXL extra-large chaise lounger lift chair by Pride. This is the only lift chair manufactured by Pride that has a 600 lb. weight capacity! Golden Technologies' Comforter Wide Series Lift Chairs are extremely comfortable and extra wide for additional support. 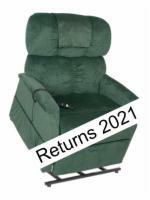 Presenting the PR-501T-28D Comforter Wide Series Lift Chair sets a new standard in craftsmanship and affordability. Golden Technologies' Comforter Wide Series Lift Chairs are extremely comfortable and extra wide for additional support. This is exclusive lift chair has an amazing 700 lbs. 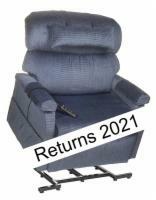 weight capacity and has triple motors for independent reclining positions.